If you are up to a challenge this is the hunt for you. Wolves are the “Ghosts of the Rockies”, and Alberta’s hardest trophy. They are big (up to 180 lbs) and smart, these crafty canines don’t come easy, but well worth the patients. We combine wolf hunts with coyote hunting and ice fishing. My favorite words come into play here “no bag limit” so when the chance comes don’t stop shooting. Wolf hunts are conducted using heated blinds over bait and calling. 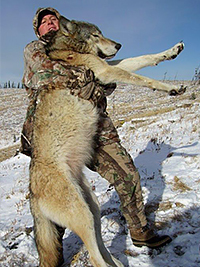 We are Alberta’s Premier wolf outfitters taking more wolf hunters than any other outfitters. Choose any weapon (Dec – Feb). Nonresidents are guaranteed tags with no draw through Savage Encounters!